Greetings fair Listener, my name is Noni Session and for at least the last 25 years, KPFA,94.1 has long been my favorite spot on the radio dial. 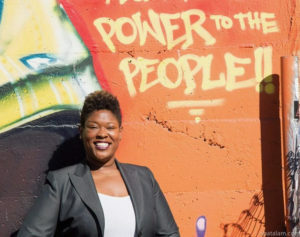 I am a 70’s born, Black, 3rd generation West Oakland Native, Mother, Assistant Librarian, Anthropologist, International Researcher, Grassroots Organizer, and now the champion of a People of Color-led Land Sovereignty fund; and yes, I still own an actual radio. Much of what I’ve been able to accomplished in my life has been in no small part due to KPFA. My femininity, my Blackness, my queerness, my avid commitment to community sovereignty, Black liberation, and all people being free everywhere is only an echo of the ways KPFA has nurtured in me a radical vision and a fair-minded approach to realizing this vision out in the world. I am unshakably dedicated to the preservation of democratic, diverse, and publicly owned radio waves. Supporting the longevity of KPFA is one of our last lines of defense against sanitized and corporate dominated airwaves. To do so, I believe we must bring the fullest version of our community into the conversation around public ownership, community sovereignty, and the hard truths we must all face to heal our communities and our nation. At all times as your local station representative, i will use clearly understood community needs and priorities to steer local station priorities and serve with integrity, honor, transparency, authenticity, fierceness, and love.